This wasn't as crispy as the name stated it would be. With that being said, it was cheesy, hash browny, and yummy! And even though I didn't have the proper quantity of cheddar cheese and had to substitute some Swiss cheese, I would definitely make this again. Look at that cheesy yummy goodness. Spray a 9' x 13' baking dish with cooking spray. Mix together the hash browns, cream of something soup, sour cream, 1/2 cup of butter, 1 1/2 cups of the cheese, scallions, salt and pepper in a large bowl. Spread the hash brown mixture in the prepared cooking dish. Combine the bread crumbs with the last 2 Tbsp butter. 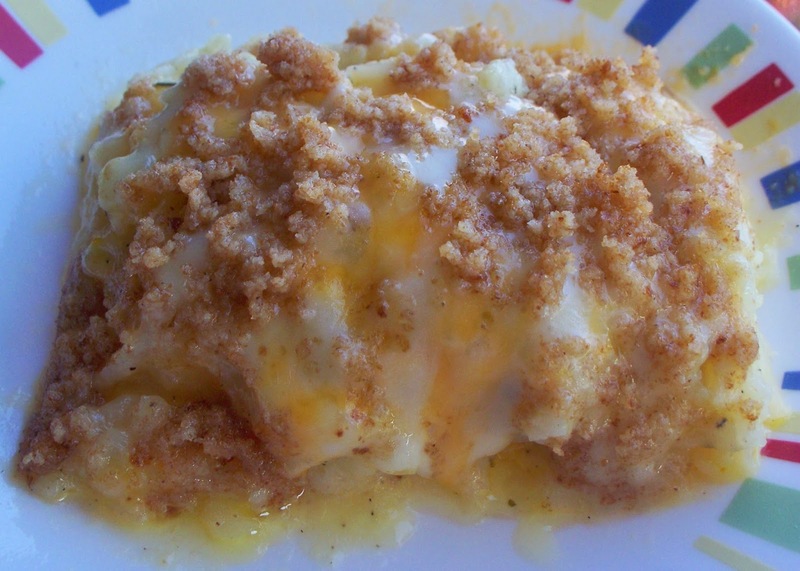 Sprinkle the remaining cheese over the top of the potatoes and then the bread crumbs.